But if you are a patient in the Brisbane area who has recently lost a tooth or requires an extraction? We have great options for your tooth replacement including bridges, dentures, and dental implants, which are often the best option. People sometimes think of dental implants as a cosmetic treatment but dental implants offer many more advantages than you can see only on the surface. Dental implants are surgically inserted into the bone. They are usually a titanium alloy screw for a tooth root with a dental crown fitted on top to complete the procedure. Together they form a complete, permanent replacement tooth. Comfort. Patients who replace all of their teeth with dental implants feel more comfortable talking, smiling and eating. Keep teeth in place. Implants are fixed in your mouth and don’t slip when you eat, talk, smile, laugh, kiss, yawn or cough. You never have to “reposition” them in your mouth or worry they will come out. Increased self-esteem. Dental implants give you back your smile, protect the structure of your face, and help you feel better about yourself. Proven Quality. Dental implants have 50 year history of reliability. High-quality dental implants look great and last a lifetime. A beautiful, natural-looking solution. Most similar to natural teeth, dental implants are designed to be a reliable, stable, and natural-looking restorative solution. Prevent and minimize bone loss. Implants transmit chewing forces to the jaw bones, helping to maintain your bone and facial structure. Without teeth your bone may resorb resulting in shifting teeth and loss of facial structure. Preserve surrounding teeth. When an implant is inserted in place of a missing tooth, adjacent health teeth are not damaged. 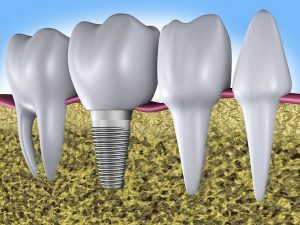 Why is Warner Lakes Dental the Right Practice for Your Dental Implant? First, we always try to save your natural teeth! It is only after all appropriate avenues to save a natural tooth are exhausted that we will recommend a replacement. The process of determining if you are a good candidate for dental implants involves a comprehensive visual examination, X-rays, and sometimes iCat 3D imaging. Even if sufficient bone density or periodontal health is not initially present, it can still be possible to get implants after bone grafts and gum tissue grafts. At Warner Lakes Dental we perform bone and periodontal grafts in the convenience of our office. If gum or bone augmentation are necessary, patients must wait for jaw/gum healing to finish before going forward with dental implants. Installing dental implants requires exacting drilling of preliminary holes that prepare the bone for the implant. These “tap holes” must be drilled at precise angles. The drills must have regulated speed control to prevent any overheating of the bone. If overheating occurs, the cells that are required for osseointegration (implant bone-bonding) with the implant will be damaged, and the implant may be rejected. At Warner Lakes Dental, we use only the newest equipment. We have the finest dental tools, treatments, and sterilization procedures. Our staff are well educated and trained in all the most up to date dental techniques. While it is possible to do an implant rapidly, sometimes even in one visit, at Warner Lakes Dental we prefer to spread the process out. We want to ensure that the implant bone-bonding occurs before going forward. However, we also try to accommodate the specific needs of our patients on a based on the needs of their case. We provide high-quality affordable dental implants to the communities in Warner, Warner Lakes, Joyner, Whiteside, Cashmere, Albany Creek, Aspley, Bridgeman Downs, Strathpine, Brendale, Bray Park, Eatons Hill, Griffin, Lawnton, Petrie, Carseldine, Chermside, Stafford Heights, Hamilton, Indooroopilly, Toowong, New Farm, Fortitude Valley, West End, South Bank, Paddington, North Brisbane and Brisbane. We also offer affordable dental implants for communities in Gympie, Gold Coast, Sunshine Coast, Sunny Bank Hills, Ipswich, Bribie Island and Buderim. At Warner Lakes Dental your oral health is important to us. We provide gentle, specialist care for conditions ranging from tooth replacement to simple cleaning and polishing. Warner Lakes Dental uses The Wand, a state of the art technology for pain less injection and anaesthesia. It’s very comfortable, reduces anxiety, and easy to use. Implant and fixtures for $2,000 and crown for only $1,750. Call us at (07) 3448 0162 or request appointment online today!